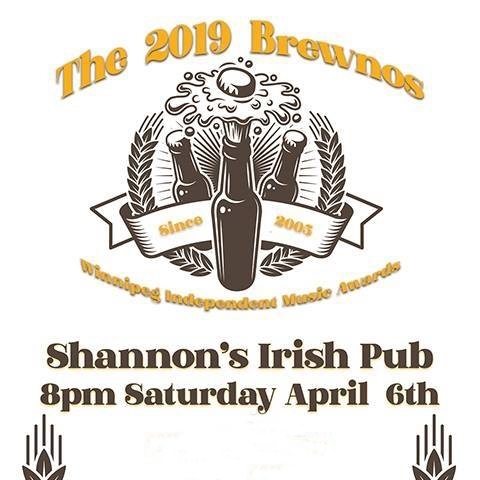 Winnipeg’s most demo­c­ra­t­ic awards show once again cel­e­brat­es the best of our local music scene, return­ing to Shannon’s Irish Pub on Sat­ur­day April 6th for it’s 14th year, fea­tur­ing a stel­lar line-up of free enter­tain­ment and great food and drink specials. After the reg­u­lar Sat­ur­day after­noon Celtic Jam host­ed by Dale Brown wraps up at 7 the fes­tiv­i­ties get under­way, with the hock­ey game on in the back­ground, dur­ing per­for­mances by Dan Deeds, Lana Win­terhalt, North­ern Roy­als, House Hand­shake, Jam­boree, Ron­nie Ladabrouk & The Elec­tric and the leg­endary Mon­u­ments Galore all for the low low cost of free! This great cel­e­bra­tion of local music is brought to you by Beer For Break­fast, and proud­ly pre­sent­ed by Big Mom­ma, Big Rock Brew­ery and 101.5 UMFM.